Labour’s pledge to abolish tuition fees was the most memorable and (regrettably) popular policy of the last General Election. Unfortunately, it didn’t receive anywhere near the level of scrutiny it deserved, many outright falsehoods went unchallenged with Theresa May relying on the old ‘Magic Money Tree’ trope that might have worked at the past two elections, but clearly wasn’t enough here. At Jeremy Corbyn’s post-election rally, he claimed that “fewer working class young people are applying to university. Let's end the debt burden and scrap tuition fees!”. Now I do not know if Corbyn is a cynical liar or merely incompetent – it’s entirely possible he’s both – but what he said was simply not true. Since tuition fees were brought in the number of disadvantaged students, as measured by eligibility for free school meals, applying to university has actually increased. As Jo Johnson, the Minister for Universities, points out – disadvantaged young people are actually 40% more likely to apply to university now than in 2010. Of course, you might wonder whether we’d have even more disadvantaged young people going to university if we’d abolished tuition fees altogether. That’s a perfectly reasonable claim. It just so happens to be false. Scotland, where tuition fees have been abolished since 2007, provides us with an excellent natural experiment. Are we more likely to make progress on getting disadvantaged young people to apply to university with fees abolished? The answer is no. In 2007, Scotland used to do about as well as England at getting young people from disadvantaged areas to university. But if you track a graph from 2007 to 2015, you see that both nations get better at encouraging students from poorer areas to apply but England does substantially better and the gap between England and Scotland is larger today than it was before fees were abolished. Interestingly, if you take the same graph but look at young people from advantaged areas instead, you get a very different result. 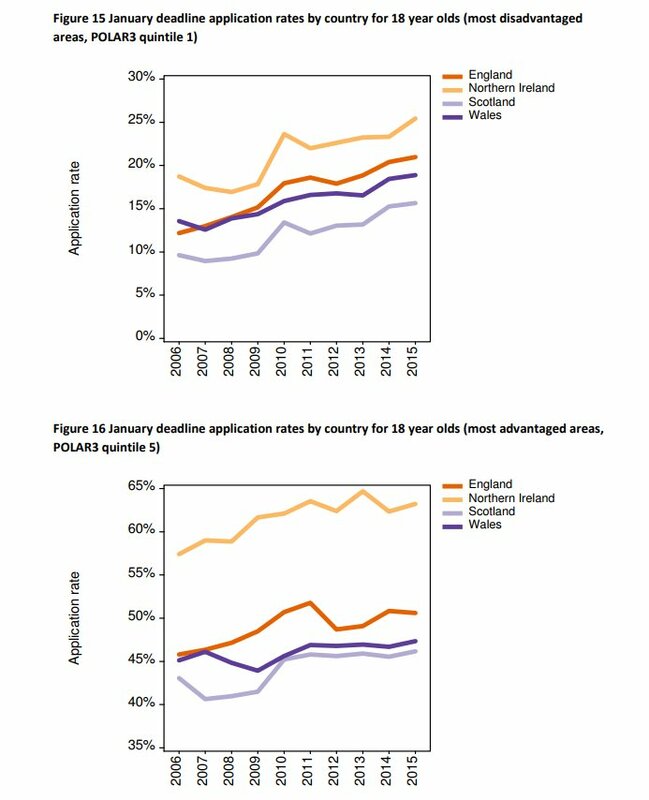 Applications rates for the well-off fell since tuition fees were tripled in England, while they increased for the well-off in Scotland. If your goal is ensuring that anyone who wants to can go to university then abolishing tuition fees simply won’t work. Advocates of free tuition typically ignore this evidence and instead frame their arguments in terms of fairness. But there’s nothing fair about free tuition. Abolishing tuition fees would cost £11bn coming out of general taxation. In other words, people who didn’t benefit from receiving a university education and will most likely earn less than graduates will be forced to pay more in tax to fund well-off graduates. At a time, when we have a £50bn deficit, funding pressures on the NHS, schools and social care, and the highest tax burden in decades, is it really wise to fund a cash transfer that well-off graduates will benefit from the most? But that’s not the only way it’s unfair. Privately-educated children are much more likely to attend university than children on free school meals. Abolishing fees doesn’t change that (as the evidence from Scotland shows), but it does mean that a greater share of public money will be spent on the children of the well-off. Another argument that usually crops head up is the ‘public good’ argument. Now when someone says education is a public good they don’t mean it in the traditional economic sense, they mean it in the same way this confused Vox writer does. Essentially, they think that education is a good thing and it’d be better if we saw more of it because it benefits not just the individual but society as a whole. But that’s not an argument for higher education to be fully funded by the state. In fact, tuition fees were originally introduced to increase university funding allowing them to expand the number of spaces on offer. And raising fees to £9,250 a year enabled the government to lift the cap on university places allowing more people than ever to go. The ‘public good’ argument just doesn’t hold water. The status quo isn’t perfect. We need to ensure that students really are getting value for money. That means equipping them with all the facts. Prospective students should have good quality information about how much they can expect to earn (and to repay) not just a few years on from university but 10-15 years down the line. The 23 universities where graduates earn less than non-graduates should be named and shamed. We should also look into broadening the options available to young people. Why not encourage universities to offer two-year degrees to attract students who don't want to pay full fees but still get a quality education? Abolishing fees would be expensive and unfair, but it'd do nothing to resolve the real problems in higher education.